On Wednesday, all-rounder Nitish Rana and Kolkata Knight Riders captain Dinesh Karthik guided visitors to their third win in the 11th edition of Indian Premier League. The two-time champions were up against Rajasthan Royals on Wednesday at the Sawai Mansingh Stadium in Jaipur. KKR beat RR by 7 seven wickets to go on top of IPL 2018 standings. Nitish Rana was again the difference maker for Dinesh Karthik led side as the Delhi born all-rounder scored a 35 with bat and took crucial wickets of set batsmen Ajinkya Rahane and D Arcy Short. Embracing the captaincy for the first time in limited overs format, Kolkata Knight Riders skipper Dinesh Karthik struck a quick-fire 42 in 23 balls. 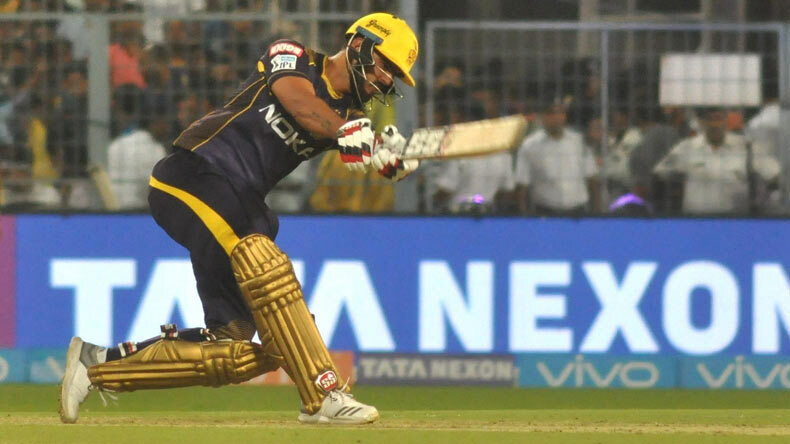 Nitish Rana and Dinesh Karthik guided visiting Kolkata Knight Riders to their third win in the 11th edition of Indian Premier League against Rajasthan Royals on Wednesday at the Sawai Mansingh Stadium in Jaipur. Embracing the captaincy for the first time in limited overs format, Kolkata Knight Riders skipper Dinesh Karthik struck a quick-fire 42 in 23 balls. Karthik hit 2 fours and 2 sixes in his captain’s innings where he held a 61 run stand with Nitish Rana. While Karthik was fruitful with his 42 run knock, Nitish Rana displayed his all-rounder traits with bat and ball. The Delhi-born was given the man of the match award for his match-winning heroics with bat and ball. The left-handed batsman and right-arm off break specialist scored 35 runs with the bat. Earlier, Rana took crucial wickets of set batsmen DJM Short and Royals skipper Ajinkiya Rahane to restrict the hosts to 160/8 in 20 overs. Chasing respectable 160 run target at the Sawai Mansingh Stadium in Jaipur, the two-time champions gained momentum with Robin Uthappa and Suni Naraine as the duo combined for an remarkable 69-run partnership. Ace batsman Robin Uthappa was a star turnout as the wicket-keeper batsman scored 48 in juts 36 balls. The 32-year old thrashed Jaydev Unadkat in the fifth over where he struk three boundaries. ALSO READ: Virender Sehwag gifts KL Rahul a new nickname on his 26th birthday! Uthappa was equally supported by Sunil Naraine, who had failed miserably with the ball earlier for the visitors. Left with a point to prove in KKR’s reply, Naraine was instrumental for the visitors as the West Indian smashed a decent 35 win 25 balls. With Uthappa falling short for another half-century thanks to a sublime catch from Ben Stokes, his partner-in crime Naraine was run out after the Powerplay concluded with the visitors reaching 53\1 in 6 overs. With the win, Kolkata Knight Riders are occupying the top position in IPL 2018 standings with 6 points.